Gallatin, TN - 2 Big Bucks Races this weekend are featured. The 2nd Annual ATI Performance BIGFOOT $40K for the Footbrake crowd at Darlington Dragway in South Carolina and the 2nd Texas Triple Tens event in Ennis, TX at the Texas Motorplex for Box and No Box Racers! Click Here for Flyers! Las Vegas, NV - Our sincere congratulations go out to each of the winners, Tuesday’s Dragster Shootout winner Jeff Burns; Maytag Wednesday’s Kev in Thorp; Racepak Thursday’s Johnny Ezell; Maytag Friday’s Million Dollar winner Peeps Pennington; and of course, today’s FTI Saturday winner Vinny DiMino. Ennis, TX - The Texas Triple Tens will be held April 26-28th, promoted by Cody Pollage and hosted by the Texas Motorplex. There will be a TNT on Thursday from 6-10, and three main event races. Electronics racers will be running for $10k each day, while the bottom bulb drivers will be racing for $5k each day. 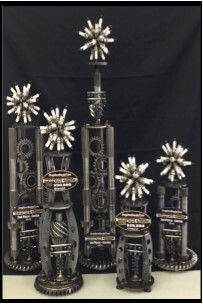 Raceland, LA - Laris’s season of solid performances is growing, the win in Houston stacked with a win in Gainsville on the Lucas Oil Series, matched up with a runner up in Dallas has provided “Baby” Laris solid ground to chase the Racing RV’s National Title in 2019, that is still early in the year for adding up points, however, Laris and company are stacking them consistently. 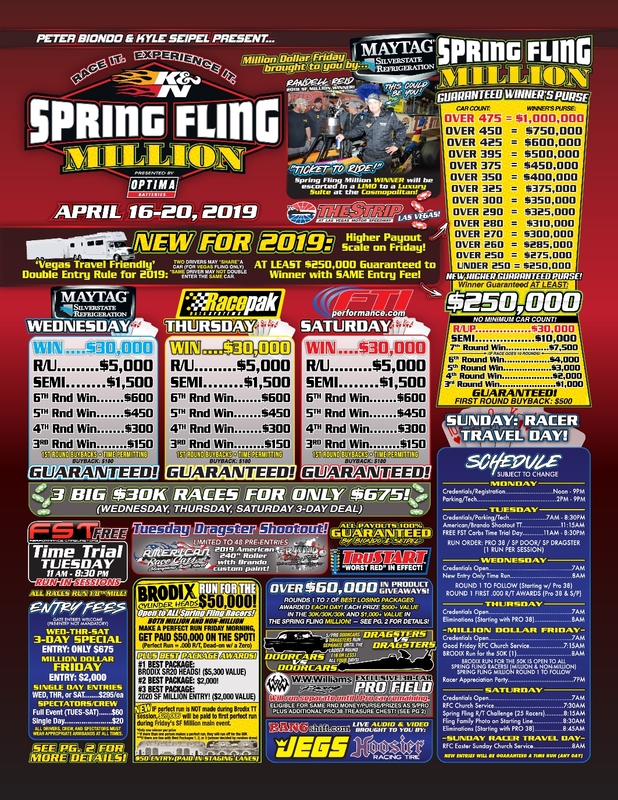 Las Vegas, NV - This week another person will join the illustrious group of Jeff Verdi, Luke Bogacki and Randal Reid as a winner of the K&N Spring Fling Million presented by Optima Batteries and held at The Strip At Las Vegas Motor Speedway. 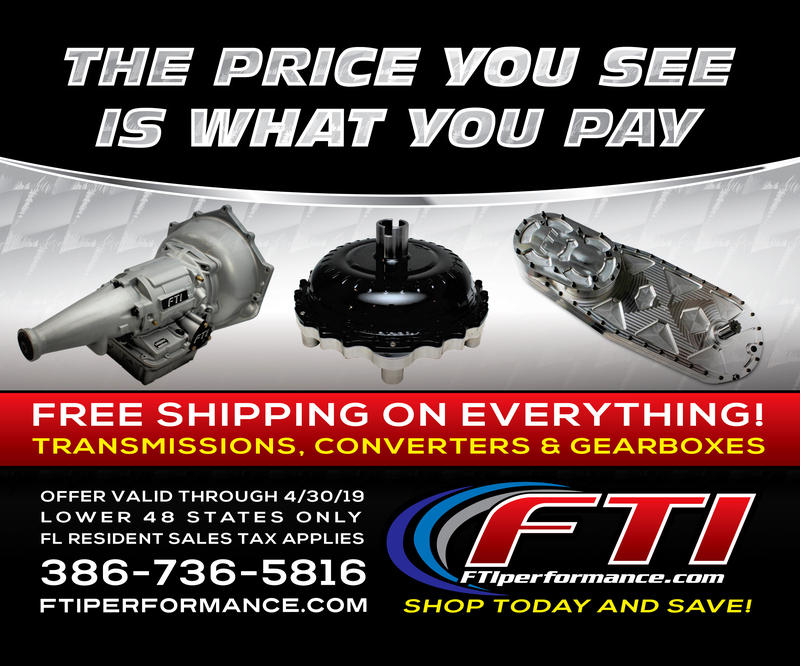 DeLand, FL - FTI Performance is offering FREE Standard Shipping on all Transmissions, Torque Converters and Gearboxes through April 30th to the lower 48 states in the U.S. CLICK HERE for More Info! 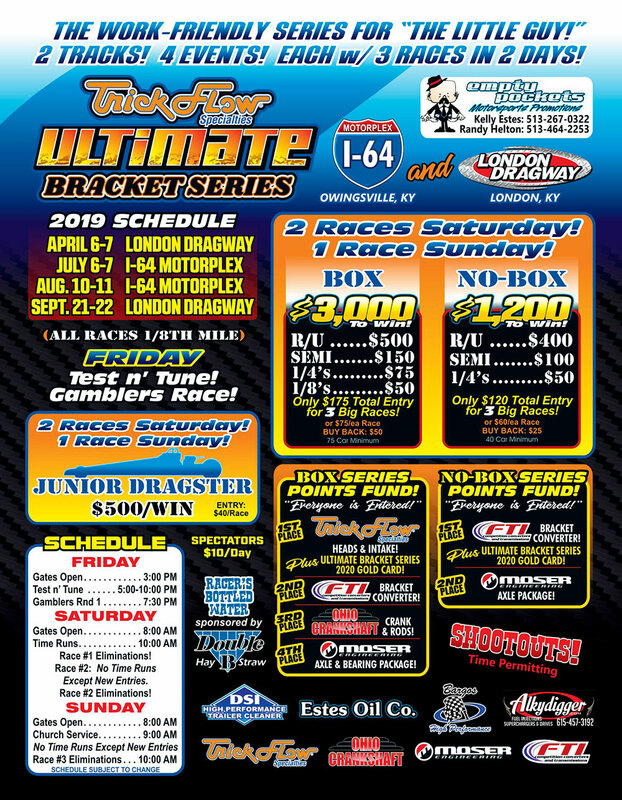 Gallatin, TN - This weekend kicks off for the Empty Pockets Guys at London Dragway with the Ultimate Bracket Series. Weekend 1 of the 4 weekend series. Great Points Series with Big Prizes for the top finishers during the year. Click Here for Race Flyer! 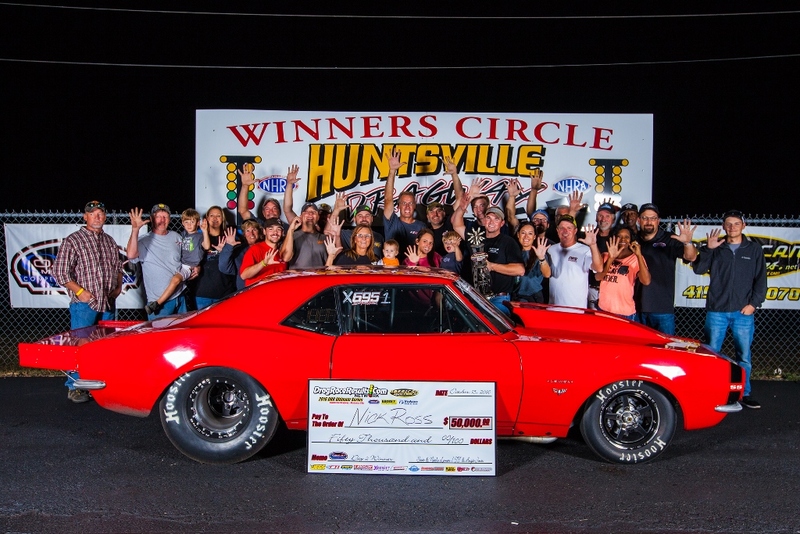 Mocksville, NC - Ten different drivers ended up as event winners at the International Hot Rod Association (IHRA) Summit Sportsman Spectacular season-opener at Farmington (N.C.) Dragway. 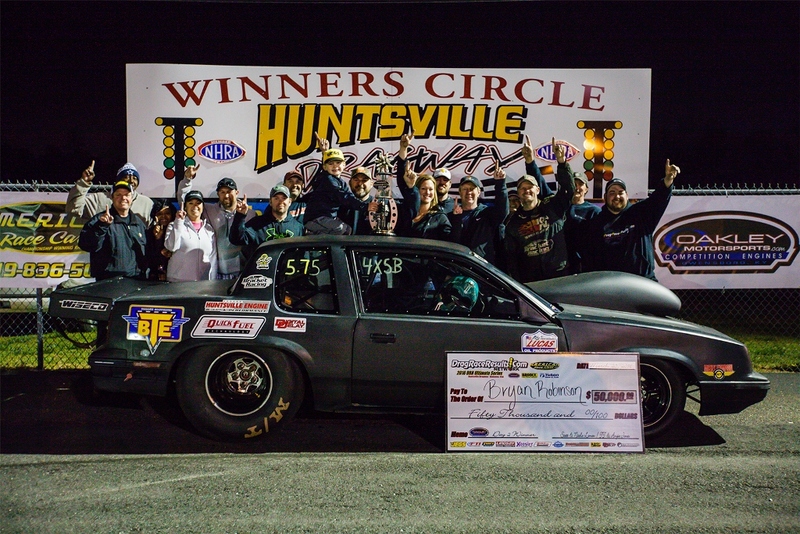 It was the largest IHRA Summit Sportsman Spectacular to date with over 300 entries each day. 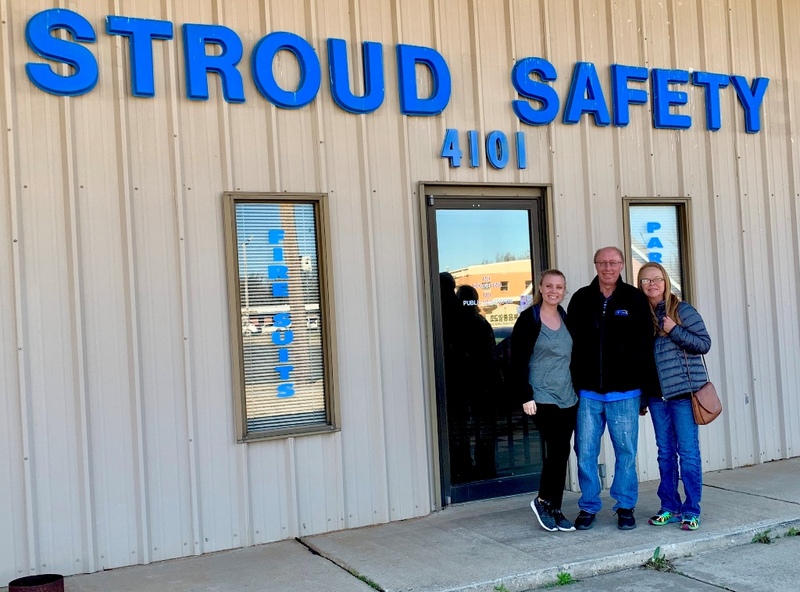 Cushing, OK - As a staple in the safety industry across the United States, Stroud is expanding their trackside dealer support. Moline Motorsports will be handling trackside support at many NHRA division 4 & 5 Lucas Oil Drag Racing Series events, along with many bracket races. 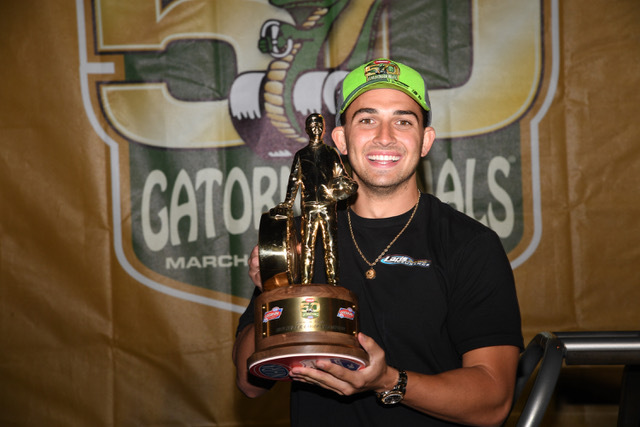 Gainesville, FL - Winning a NHRA National Event Wally is difficult, winning the 50th NHRA Gatornationals this past weekend was extremely challenging for Holden Laris winning Super Comp. 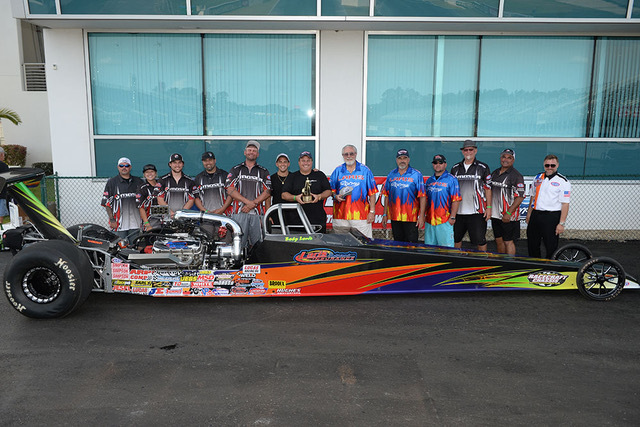 Holden snagged his 3rd NHRA National Event Wally this past weekend in Gainesville for Laris Motorsports Insurance. 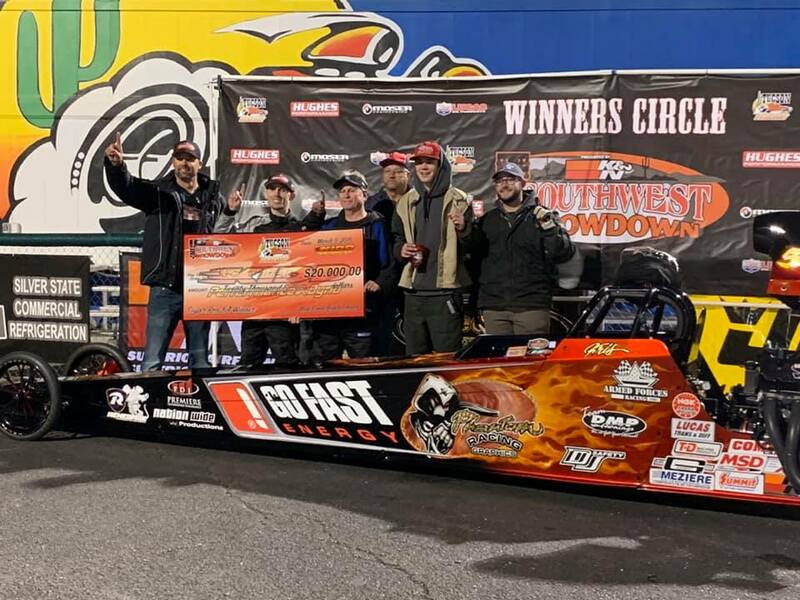 Gainesville, FL - Ross Laris and his family pull no punches when it comes to NHRA/Lucas Oil Drag Racing Series and they rolled into Gainesville for the “Baby Gators” and grabbed a Wally in Top Dragster along with being the Number 1 Qualifier to kick off the 2019 Season. 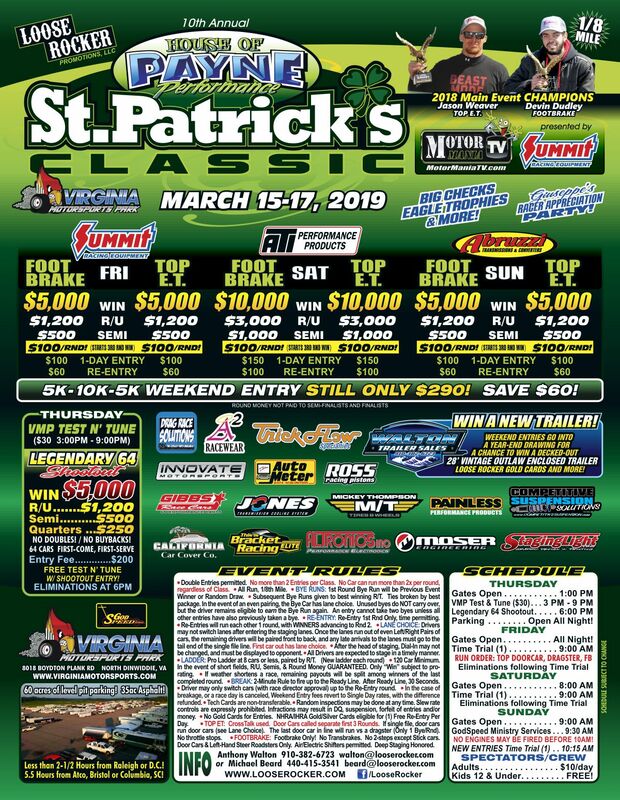 Dinwiddie, VA - Live Coverage from the Loose Rocker Promotion's St Patrick's Classic goes live Friday around 11:30 E.S.T. 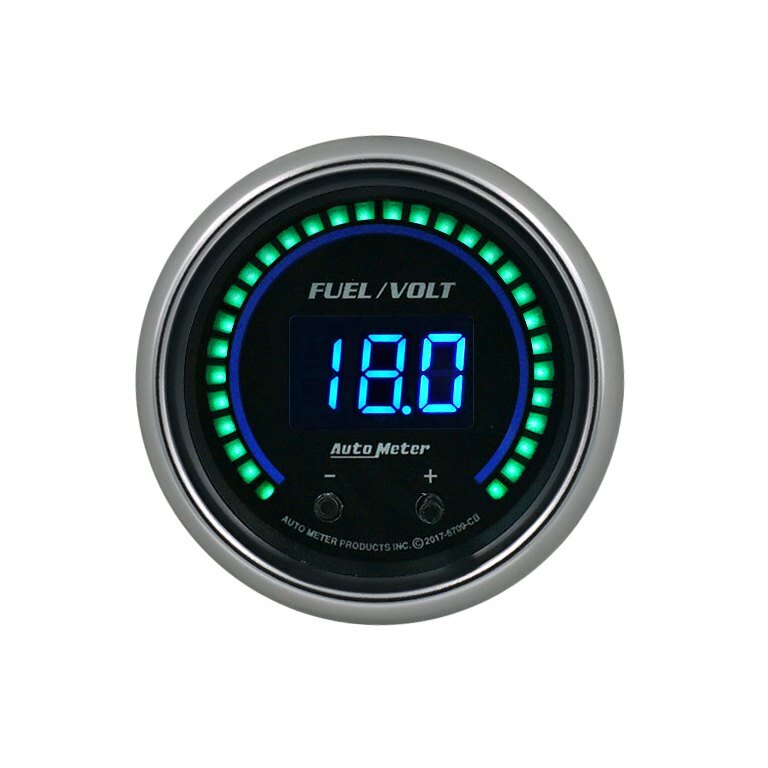 and continues thru the weekend at Virginia Motorsports Park in Dinwiddie, VA.
Sycamore, IL - Each gauge allows you to have two independent readings within a single gauge and features a bright LED seven segment display and thirty radial LED indicators. 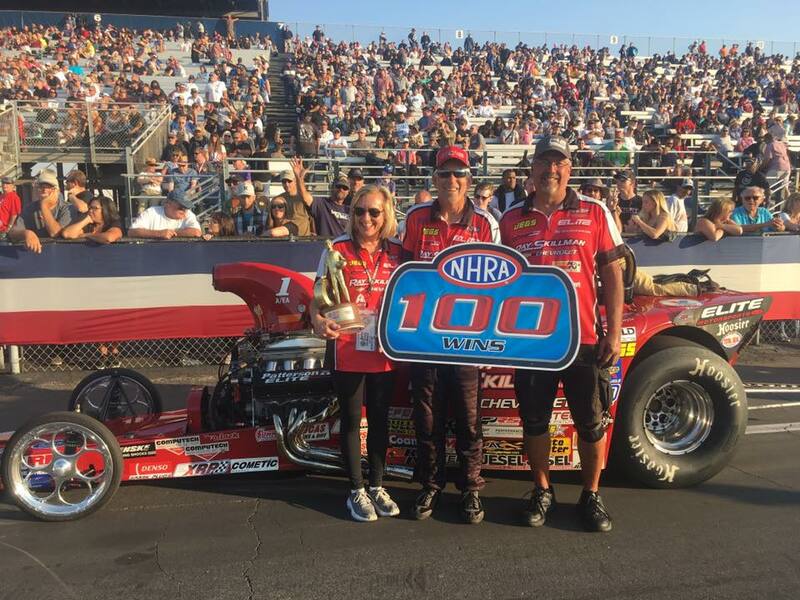 Pomona, CA - Steve Williams locked up the 2018 NHRA Lucas Oil Drag Racing Series Super Comp World Championship and David Rampy won his 100th NHRA national event this weekend at Auto Club Raceway and the Auto Club NHRA Finals. Las Vegas, NV - Justin Lamb, Devin Isenhower, Brian McClanahan, Paul Nero and Ronnie Proctor all clinched NHRA Lucas Oil Drag Racing Series World Championships this weekend at the NHRA Pacific Division Lucas Oil Series event at The Strip at Las Vegas Motor Speedway. 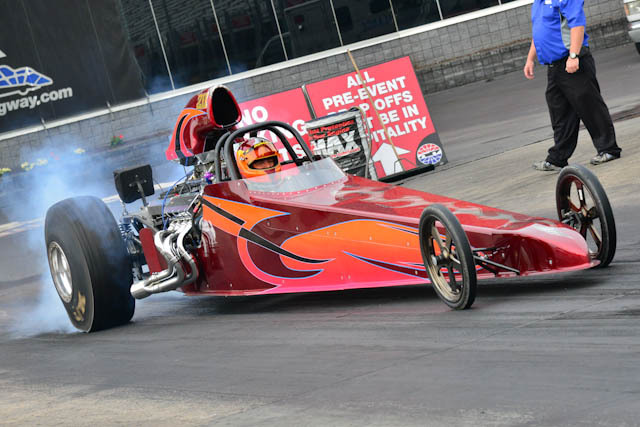 Las Vegas, NV - Brian Hyerstay and Pete Peery took home the trophies in Comp and Super Stock respectively In the division’s Top Dragster and Top Sportsman classes, Ed Olpin beat Steve Casner and Jeff Gillette won over Paul Mitsos. 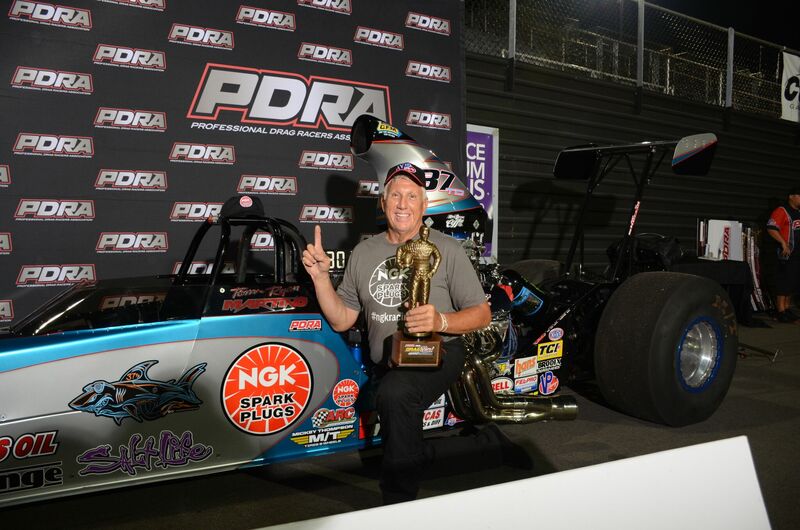 Noble, OK - In the final results from Thunder Valley Raceway Park and the NHRA Lucas Oil Drag Racing Series, Jeff Lopez, Irving, Texas, claimed titles in both Super Gas and Stock Eliminator. 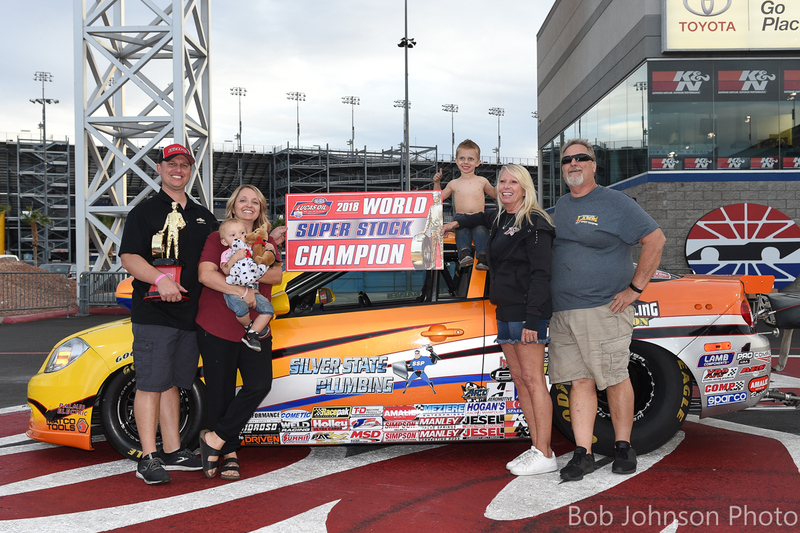 Las Vegas, NV - Other racers visiting the winner’s circle this weekend were David Billingsley, Decatur, Ill., in Comp Eliminator; Justin Lamb, Henderson, Nev., in Super Stock; Kevin Wright, Longmont, Colo., in Super Comp and Matt Blodgett, Signal Hill, Calif., in Super Gas. Dallas, TX - Teuton will join the likes of Eddie Hill, Raymond Beadle, Kenny Bernstein, Bill Meyer and many more in the South Central Division Hall of Fame. Waxahachie, TX - The father-son race team will continue their partnership with SDPC Raceshop while Callies Performance provides essential parts for their rebuilds. 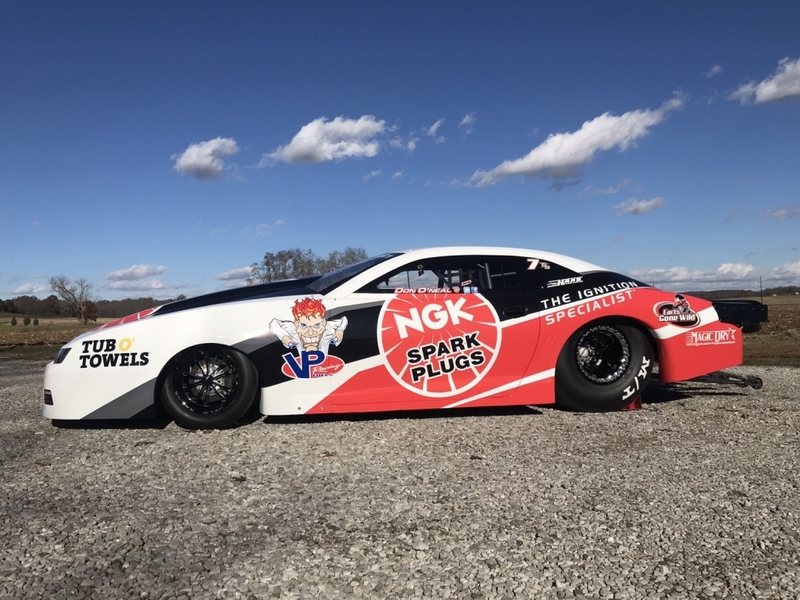 Evansville, IN - O’Neal, who finished seventh in the NHRA’s national Top Sportsman standings in 2018, will compete with a different vehicle and power package in 2019. His new race car, a 2015 Chevrolet Camaro, will be powered by a Magnuson-supercharged Chevrolet 427 LS engine with VP Racing methanol. 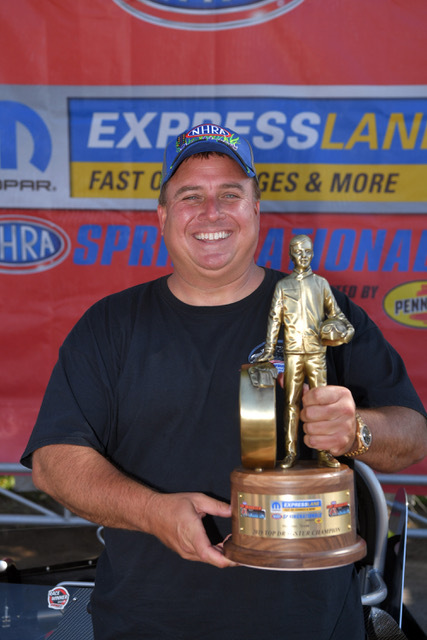 Malspeth, NY - 7- Time NHRA World Champion and Multi-Time Big Buck Bracket Race Winner Peter Biondo takes you inside his brain, offers his way of thinking and what has contributed to some of his racing success over the past 2 1/2 decades. Waxahachie, TX - The Chase-N-Dad Racing team spent Thanksgiving weekend closing out the 2018 season by representing their partners at two different events and locations. Youngstown, OH - This is definitely an experience we will never forget. It felt like the 12th round of a highly contested boxing match going into our fourth round of competition with 17 points separating us from the point leader, Angela Gantkowski. 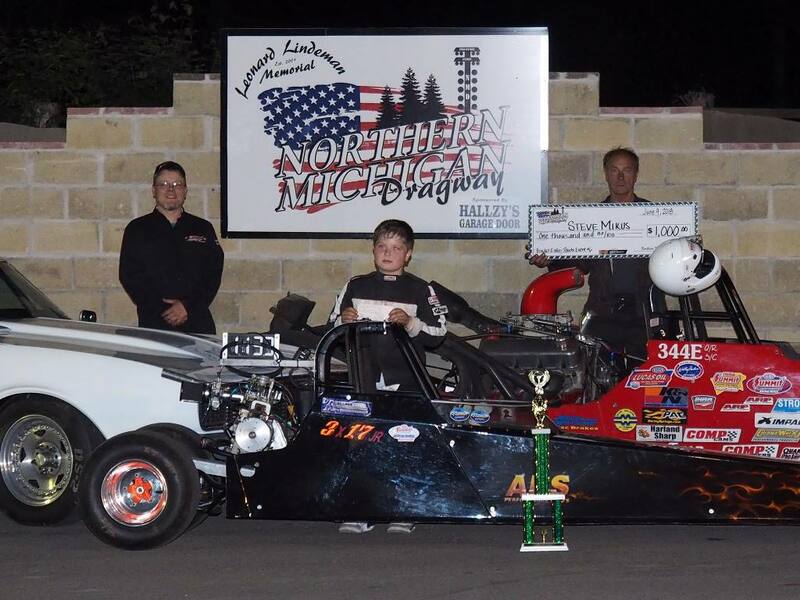 Gallatin, TN - Big Money Bracket Racer Cory Gulitti from Spring, Texas is our latest featured racer on DRR Dozen Questions presented by Brodix. DRR will be interviewing some of the nation's most prolific racing members of our community this year. Stay tuned for someone new over the next few months. 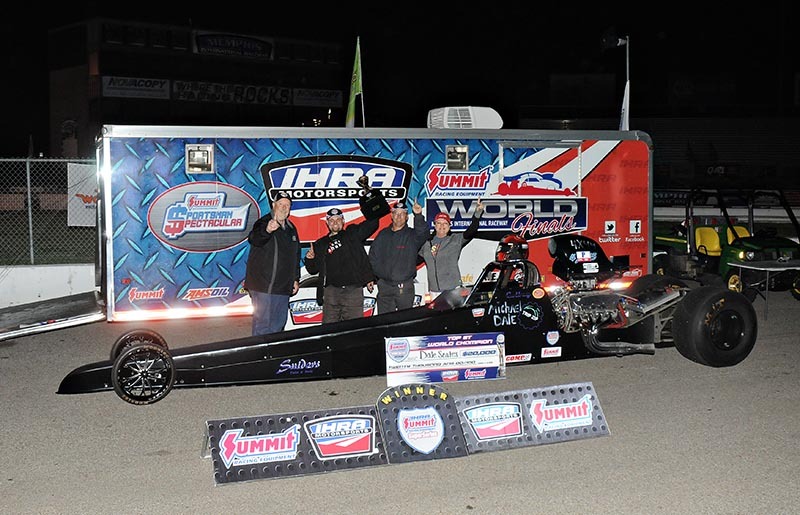 Ennis, TX - The AAA Texas Fall Nationals held at The Texas Motorplex have concluded. Although Chase-N-Dad Racing didn’t make a final round appearance, the weekend was still a major success. Kaleva, MI - Super weather conditions brought out another great showing of racers and fans to Northern Michigan Dragway. Over 170 race entries battled it out Saturday night at TNT Points Event #6. The Mikus family of racers had possibly their most memorable night of racing in their storied race career. West Palm Beach, FL - The International Hot Rod Association (IHRA) and Moser Engineering announce a partnership extension that will see Moser Engineering support the IHRA Summit Sportsman Spectacular, IHRA Summit Team Finals and IHRA Summit SuperSeries World Finals events. Oklahoma City, OK - Add to your professional image with a coordinated color theme. 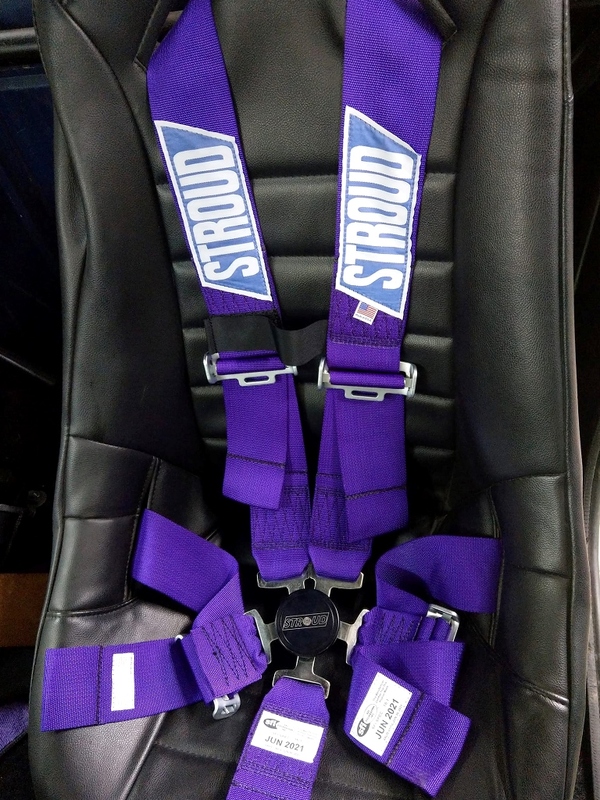 Stroud SFI rated harnesses are available in 5, 6, 7, and 9 point styles. All colors available in either Kam-Lock or Latch & Link release systems. 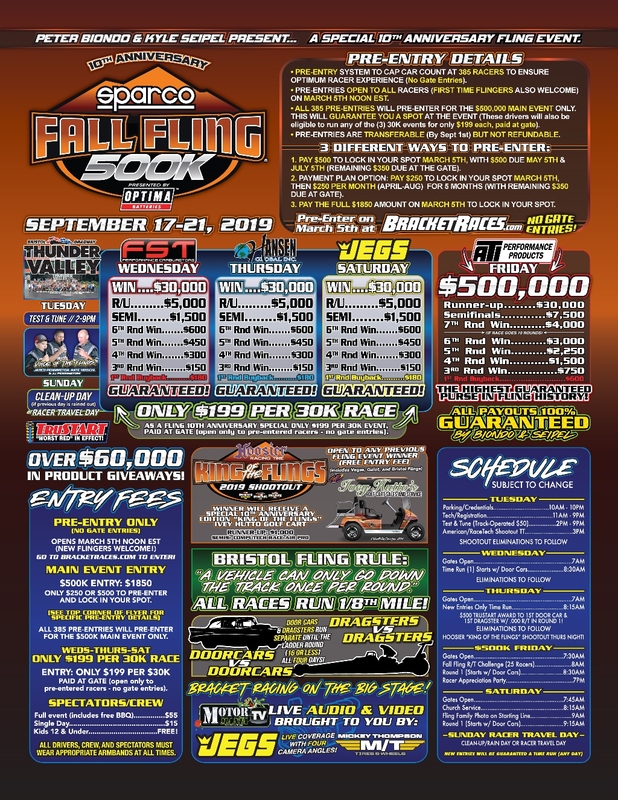 Sauk Village, IL - FTI Performance returns in 2019 with major support of the SFG Promotions’ events. 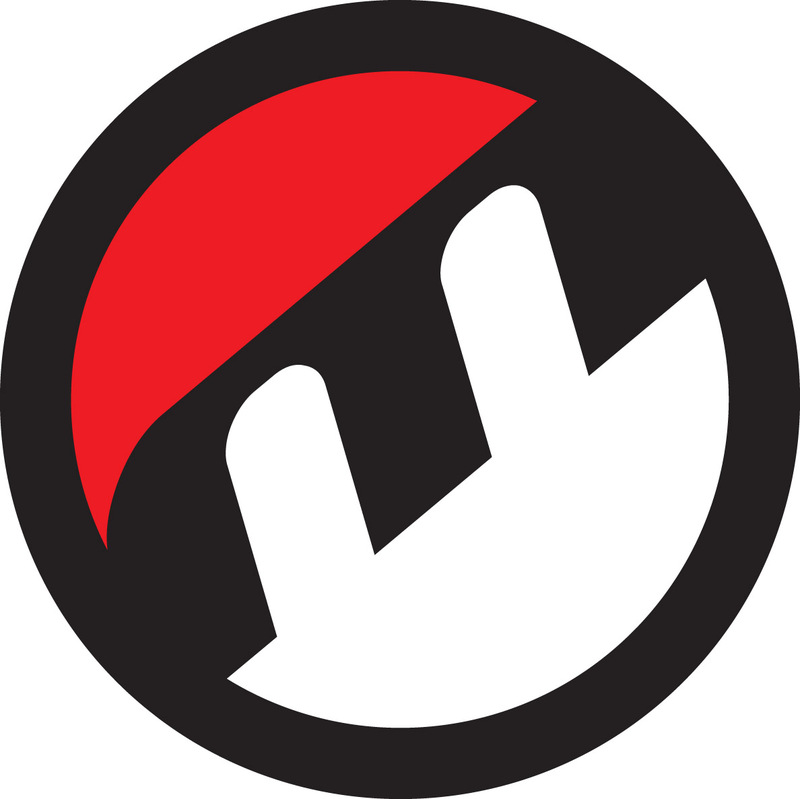 FuelTech USA will be the presenting sponsor of this year’s Super Bowl of Bracket Racing in Rockingham, NC and the SFG300 Series event in Montgomery, AL. Lebanon, TN - We will still be your one stop shop for Hoosier Racing Tires, along with VP Racing Fuels, RacePak, BTE Transmissions and parts, K&R Electronics, Pro 1 Safety Products, and even more products to come in 2019! DeLand, FL - In addition to the contingency postings FTI performance has stepped up with the low qualifier bonus for division 3 and division 7 paying an additional $200 to each low qualifier in Top dragster and Top sportsman regardless of product usage. 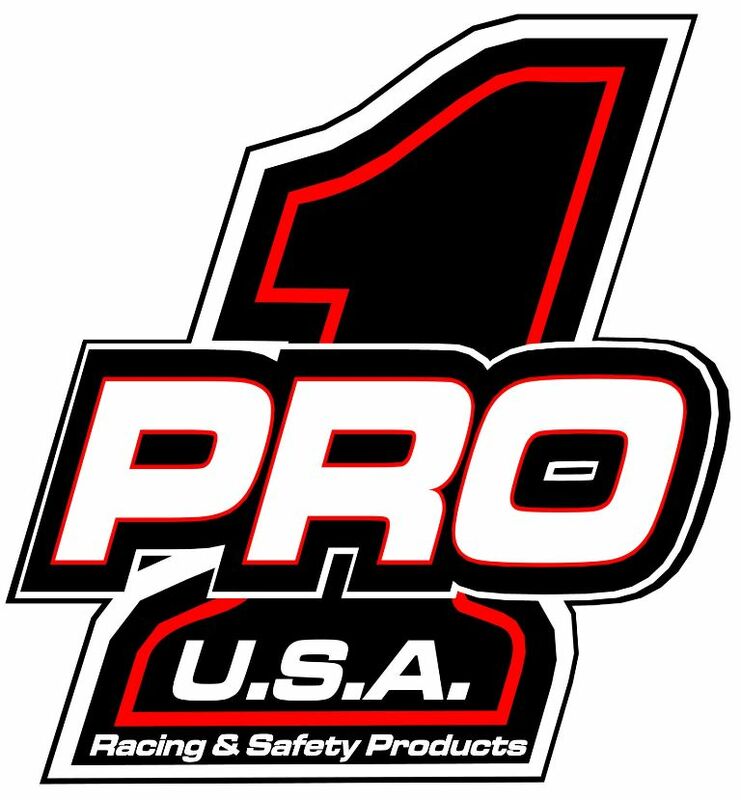 Sauk Village, IL - Pro 1 Racing and Safety will be the Official Safety Equipment of SFG Promotions in 2019. Jeff and Charlotte Hefler will be awarding one set of Pro 1 Cam Lock Safety Harnesses at each race this year. 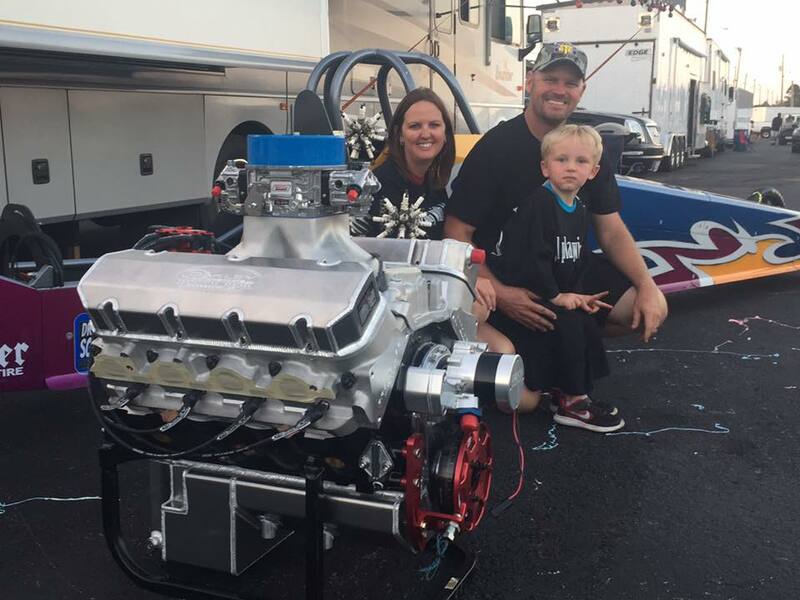 Owensboro, IN - Oakley Motorsports is based in Ownesboro, Ky., and has been providing winning high-performance horsepower for Drag Racing, Circle Track, Tractor Pulling and Street Cars for over a decade. 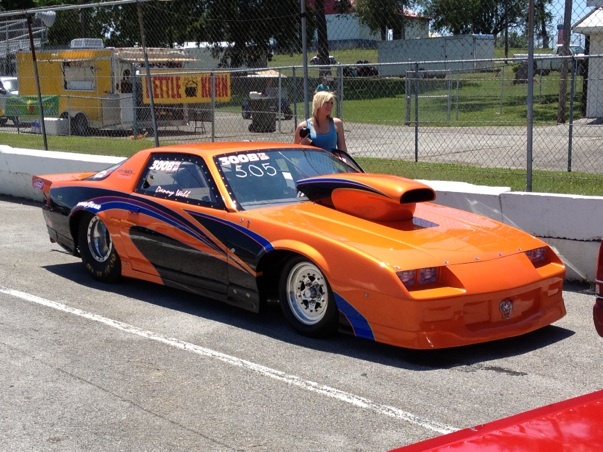 Memphis, TN - Rick Taylor has built many racer cars over the years and is known for some of the cleanest rides at the track. This time Rick did something he's always wanted to do. A duel build and we are going to show it to you in detail. 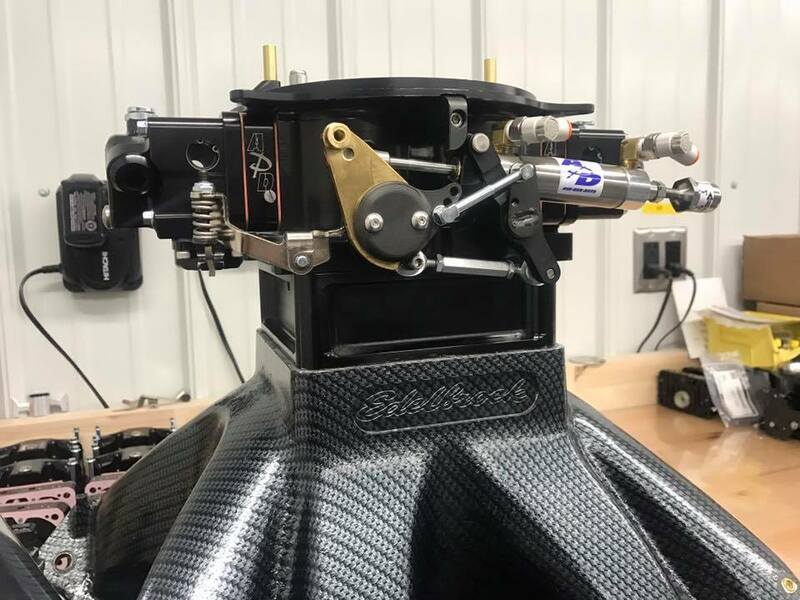 Sauk Village, IL - Todd's Extreme Paint will be providing the custom colors on the 2019 Dragster which will be raced for next November in Darlington. As 2019 takes shape, Kyle Riley and the SFG staff have already began work on 2020 and the SFG 300 Series. Eighty Four, PA - This system is ideal for the racer who doesn't want the weight on the car or doesn't have room to mount the original system. 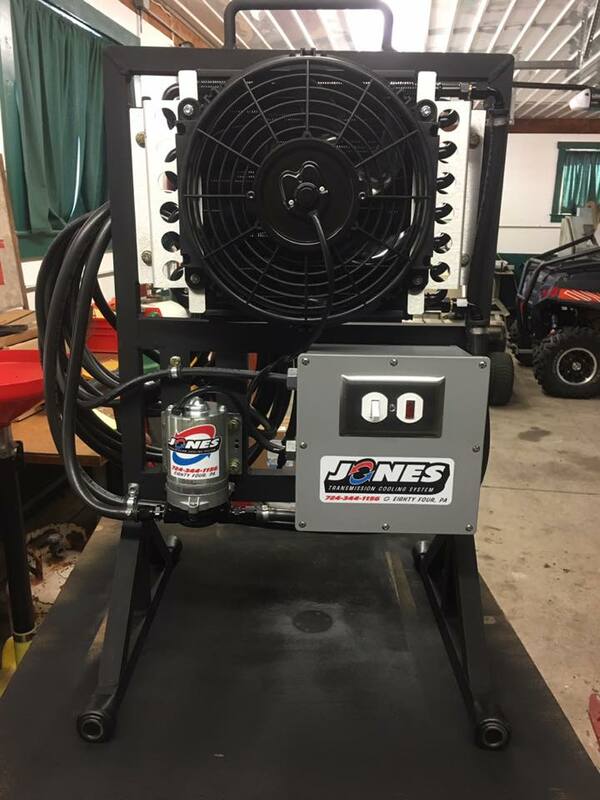 It's a complete free standing unit that can be hauled in your trailer and connected to your car in seconds between rounds with a couple Jiffy-tite fittings. Las Vegas, NV - The K&N Spring Fling Million presented by Optima kicks off Tuesday afternoon and runs through Saturday. Friday sees racers competing for a "minimum" of $250,000 to win. CLICK HERE for Live Video all week long presented by JEGS & Hoosier Tire. Gallatin, TN - 2 Featured Races on the schedule this weekend. 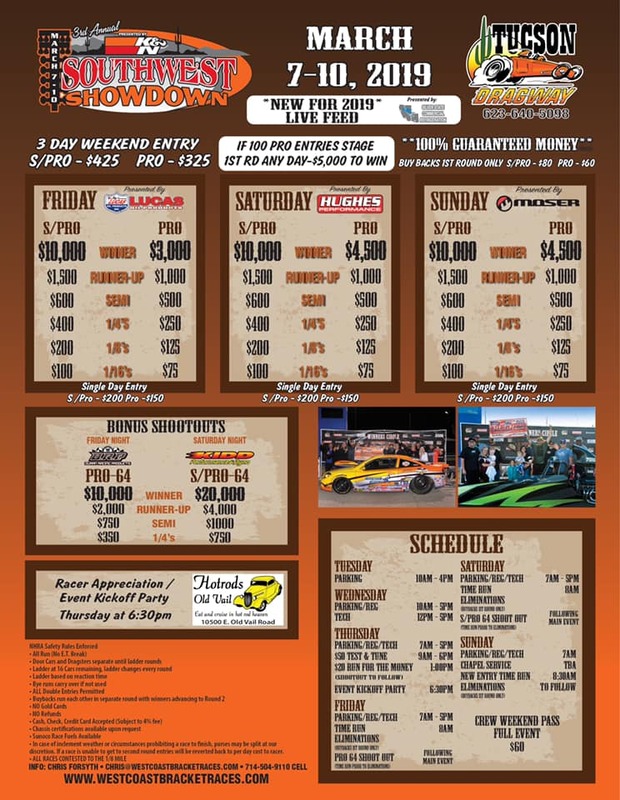 The Re-Scheduled Summit Sportsman Spectacular at State Capitol Raceway in Louisiana and the Pre-Entry Only Inaugural Tennessee Throwdown in Ethridge, Tennessee. Click Here for Race Flyers! 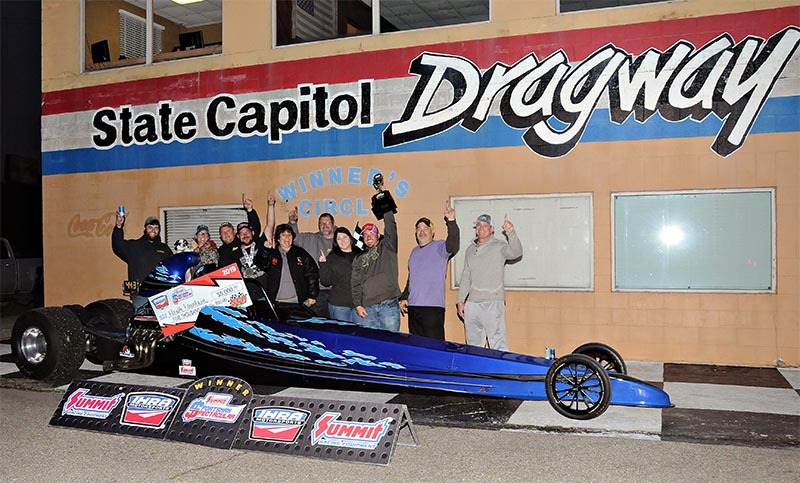 Gallatin, TN - 5 Featured Races this weekend including 2 Summit Sportsman Spectacular Events (Xtreme Raceway Park & Farmington Dragway), Carolina Dragway's March Madness, the Footbrake 150 in Gulfport, MS. and the Lets Make a Deal at Huntsville Dragway. Click Here for Race Flyers! Gallatin, TN - As we roll into March the major races keep coming and this weekend is no exception. The TenG@BG debuts this weekend in Bowling Green, KY. The Loose Rocker Gang takes their St. Patrick's Classic back to Virginia Motorsports Park and Texas see's the debut of the Texas Triple Tens at the Texas Motorplex in Ennis, TX. CLICK HERE for Flyers! 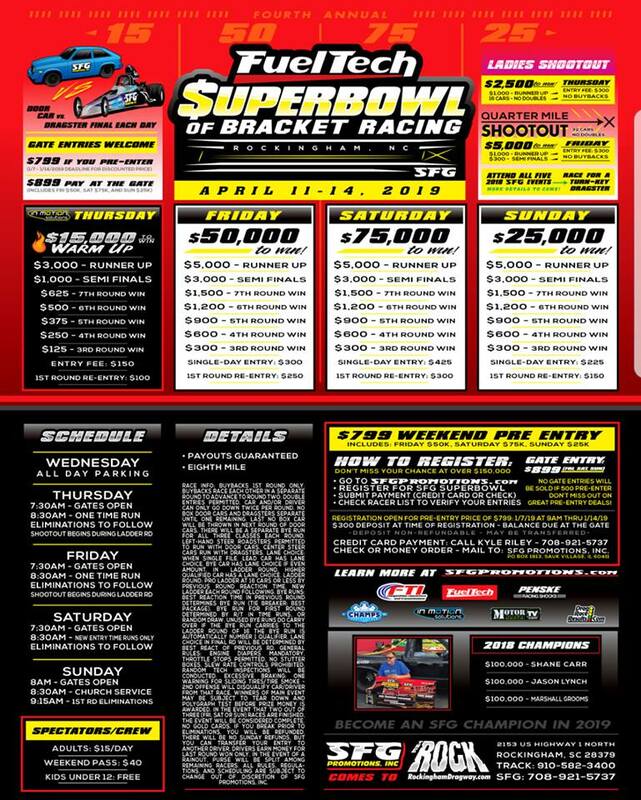 Darlington, SC - Live Coverage from the FTI Performance Powerball of Bracket Racing goes live Thursday 12 Noon E.S.T. 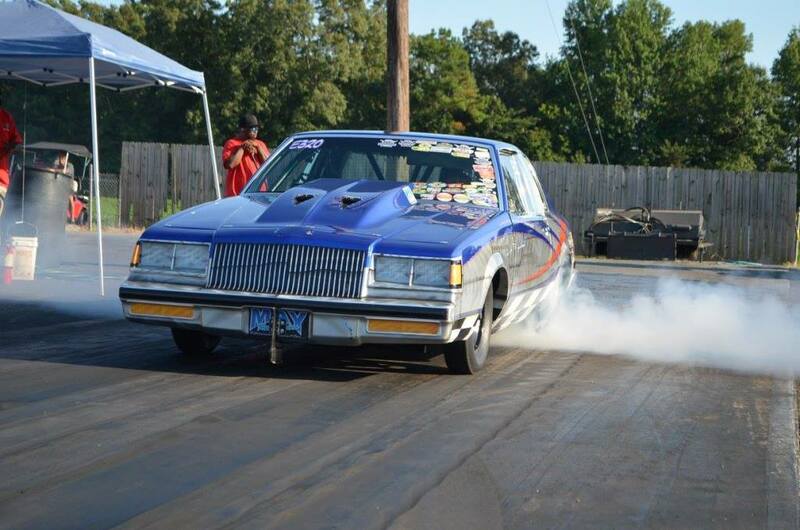 and continues thru the weekend at Darlington Dragway in Hartsville, SC. Darlington, SC - Racing action begins Thursday with a $15,000 to Win Warm-Up and continues into the weekend with $50,000 to Win on Friday, $75,000 to Win on Saturday and finished off with a $25,000 to Win race on Sunday. 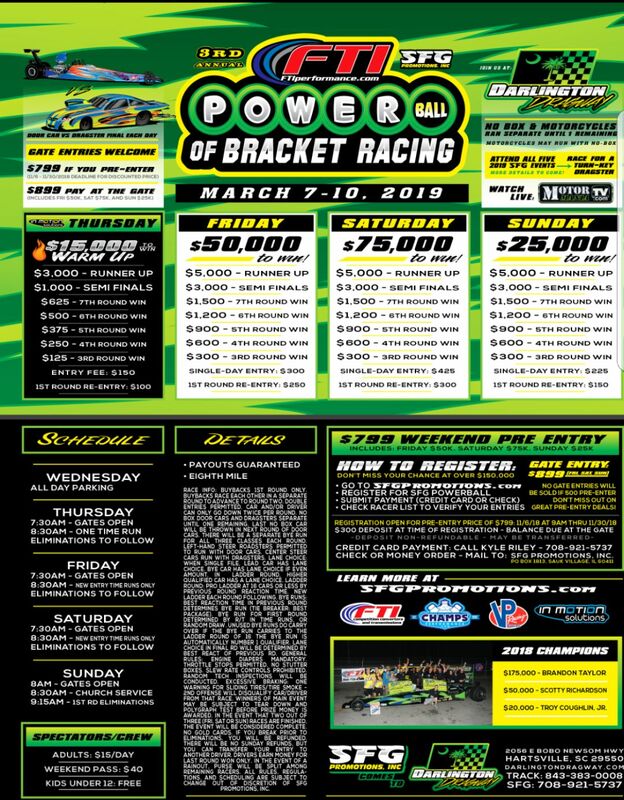 Gallatin, TN - SFG Promotions will host the Powerball of Bracket Racing in Darlington, South Carolina. 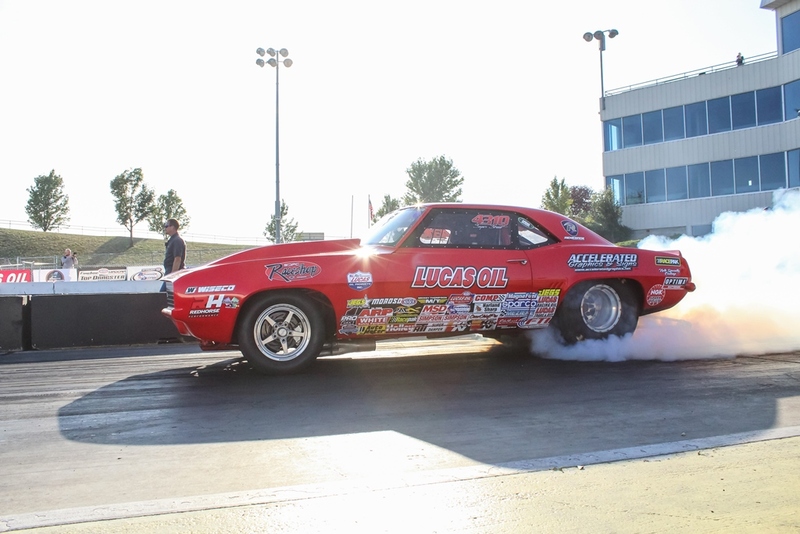 The Southwest Showdown will be held at Tucson Dragway in Arizona while the Southern All Doorcar Nationals will be contested at Huntsville Dragway in Alabama. Click Here for Flyers! 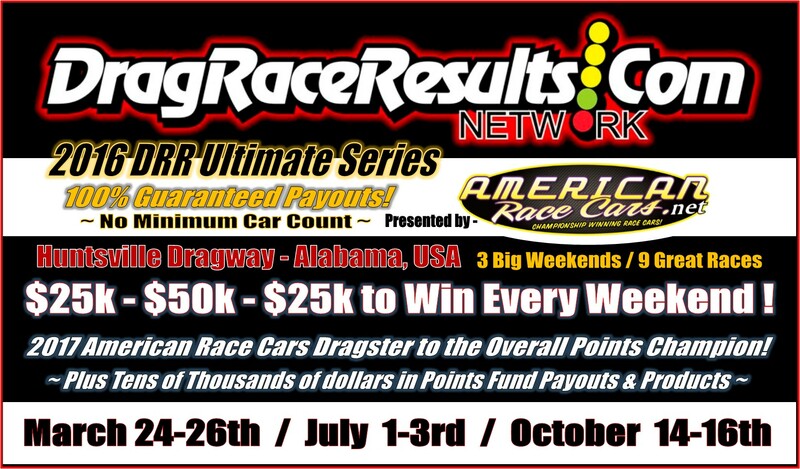 Gallatin, TN - DRR, American Race Cars and Huntsville Dragway return in 2017 bringing you “MORE THAN JUST A RACE”, a 3 Weekend / 9 Race Bracket Racing Series that overall pays out more for 1 Class than any Sportsman Drag Racing Series in the country! Gallatin, TN - The JEGS Championship Points includes product prizes from over 40 companies that are supporting the racers participating at the 2017 DRR Ultimate Series. 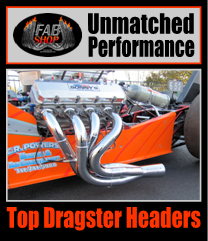 Check them out and keep them in mind when building and updating your race cars. Support the companies who support you! Gallatin, TN - DRR has partnered with many extraordinary manufacturers and with their help have put together the JEGS Championship Points Fund which includes over $125,000 of points fund prizes and payouts. Galltin, TN - Welcome to the 2017 DRR Ultimate Series presented by American Race Cars. LIVE COVERAGE presented by Quick Performance will cover all 9 races over the course of 3 weekends in Huntsville, Alabama beginning March 24th. Huntsville, AL - We know you have many choices and we hope you feel the quality of race you attended was worth it. In case you haven't seen the dates we released earlier this month, they are listed below. We hope this helps when making up your schedule. 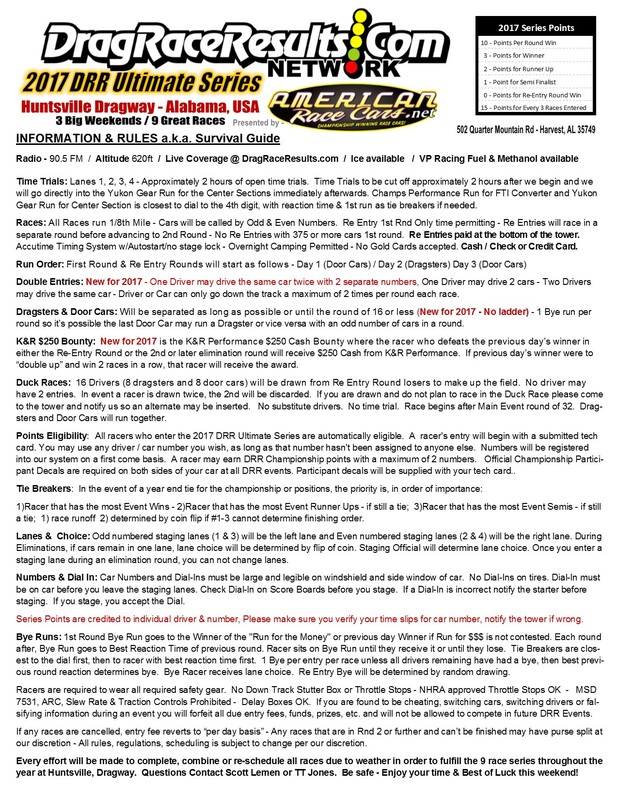 Gallatin, TN - Welcome to the DRR Ultimate Series presented by American Race Cars. Starting in March, DragRaceResults and Huntsville Dragway commit to bring you “MORE THAN JUST A RACE” in 2016. We hope to see you in Huntsville, Alabama this October! Gallatin, TN - Luke Bogacki, Kenny Underwood and Mike Bloomfield Jr sit atop the Leader Board after 6 races in Huntsville. Click here for complete points standings. Gallatin, TN - Click Here for more information on the products and companies involved with the 2016 DRR Ultimate Series. Huntsville, AL - Luke Bogacki is undoubtedly one of the best Sportsman Racers of our time. 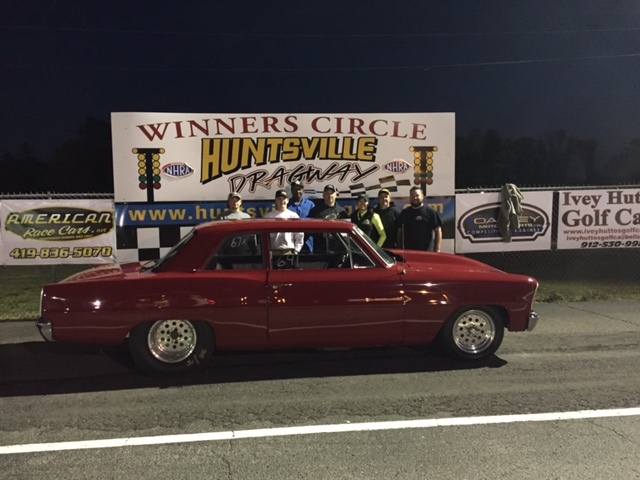 Last weekend in Huntsville he proved just that as he took not just one, but 2 cars to the top spots of the Inaugural DRR Ultimate Series finishing 1st and 2nd overall. Respectfully Thomas Bell finished 3rd and Kevin Rodden finished 4th. 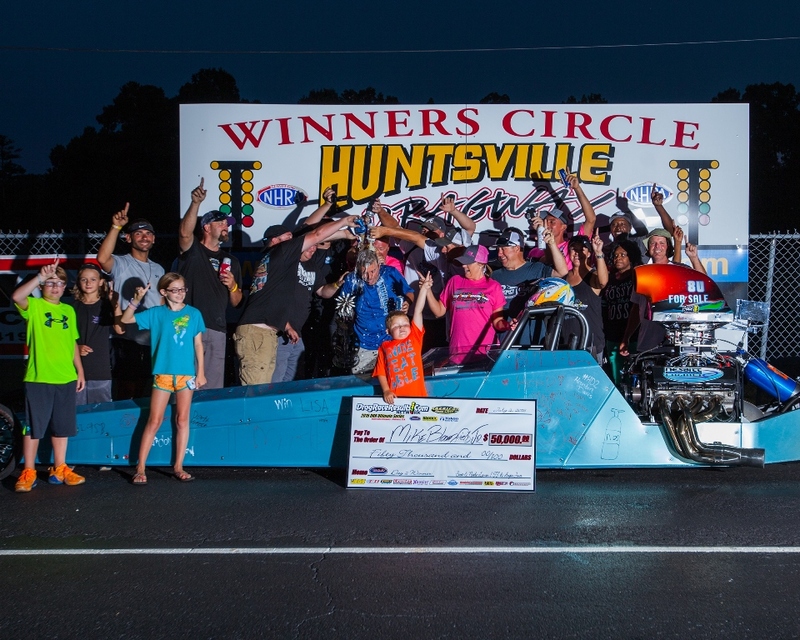 Huntsville, AL - Nick Ross out of Gardendale, Alabama secured the biggest victory of his young racing career on Saturday Night when he won the Oakley Motorsports $50,000 main event defeating Luke Bogcki in the final round. Gallatin, TN - LIVE COVERAGE from the DRR 2016 Ultimate Series in Huntsville, Alabama. Click here for all the racing action. Coverage begins Friday morning 9 am with time trials. Huntsville, AL - Saturday was "Little Mike's" day. He showed the talent that he has been taught his whole life, winning rounds he should and winning those he must in order to make it to the biggest final of his young racing career. Averaging .011 on the tree through the 8 rounds. Gallatin, TN - Bryan Robinson from Iuka, Mississippi was the inaugural winner of the 2016 DRR Ultimate Series with his Oakley Performance $50,000 win over Brian Folk on Friday Night.